KBIS is bigger and better than ever. Under the banner of Design & Construction Week™, KBIS and IBS will welcome over 1,600 shared exhibitors in 60,000 feet of exhibit space, February 4-6, 2014, From celebrating great design, to innovative new product and meaningful networking opportunities — KBIS is an event you won’t want to miss. And…a big announcement about a special social media event taking place on the show floor! Exhibitors: Tell us about your events during the chat, too. 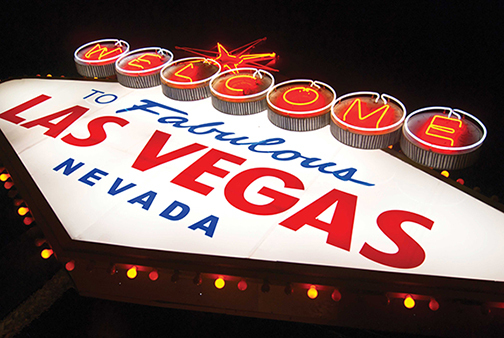 You can leave what happens in VEGAS there, but be prepared to share everything about KBIS! Q1: We’ve partnered with @IBSVegas for the 1st #DCW2014. How will you be working both shows into your Vegas experience? Q3 #NKBAU is coming to #KBIS2014. Planning on taking in any sessions, courses or speakers? Q4 New #KBISInnovation awards for booth design! What’s the most amazing thing you’ve seen in a booth at a trade show? Q5: Exhibitors! We want to know what you’re up to! Any events you can share? Q6: The #KBIS2014 app is available on iTunes! What other apps or tools will you be using during the show? KBIS, in conjunction with the National Kitchen and Bath Association (NKBA) is an inspiring, interactive platform that showcases the latest industry products, trends and technologies. KBIS has been the voice of the kitchen and bath industry for 50 years. This year’s expo sees the return of many large brands alongside our Loyalty Leaders and other innovative manufacturers on a packed show floor. Join us in Las Vegas from February 4-6, 2014 to experience the best the kitchen and bath industry has to offer. For the latest news and announcements visit www.KBIS.com, follow KBIS on Facebook and on Twitter at @KBIS2014. KBIS is hosting and sponsoring this Kbtribechat.